Declared in 1995, the 34,400 km2 Kaa-Iya del Gran Chaco National Park is the first protected area in South America co-managed by an indigenous organization, the Capitanía del Alto y Bajo Isoso (CABI). In 1997, based on historical occupation by the Isoseño-Guaraní over the past 300 years, CABI formally demanded a 19,000 km2 `Tierra Comunitaria de Orígen' (TCO) that adjoins, but does not overlap, the national park. The creation of TCOs and the co-administration of protected areas are elements of decentralization processes in Bolivia, whereby the management of land and natural resources is devolving to departmental and municipal levels of government. 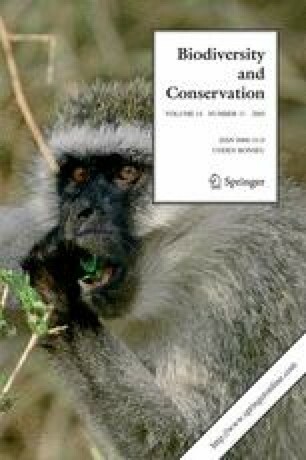 This paper examines biodiversity monitoring in the context of a community wildlife management program developed with CABI. Hunter self-monitoring (100–150 hunters per month) combined with monthly activity records for potential hunters (7637 observed hunter-months) permit estimations of total offtakes of subsistence game species for 1996–2003, as well as catch-per-unit-effort over the same time period. These data show considerable fluctuations from year to year and no declining trends that would suggest over-hunting. Monitoring populations of multiple game species can be relatively expensive, even with the voluntary support of hunters, considering data collection and analysis, as well as presentation and discussion through community meetings. At the same time, monitoring does not provide highly accurate assessments of short-term changes in wildlife resources. However, relatively simple participatory methods are important for generating information on long-term trends and for creating a context for community discussion of formal wildlife management.